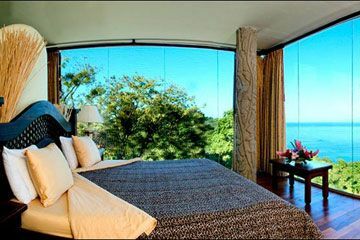 Our Penthouse Suites provide a panoramic glass wall opening your sumptuous King bed and sitting area to breathtaking views of the crystal blue ocean, crescent bay, jungle and distant mountains. Each Penthouse is remarkably spacious and quietly elegant. From the superbly crafted furnishings and hardwood floors to the stonework surrounding your private Jacuzzi, our Penthouses truly provide you the experience of being in a world apart.